October is Breast Cancer Awareness month so it's fitting to make a pink themed card. I used The Stamping Boutique's fairy Cynthia digi stamp. I colored her in using Copics, added some glitter to her wings and sponged the cardstock with pink. I added some zigzag stitches to the green cardstock to give it some texture. The flower is made using MFT's rolled rose die-namics. I used chipboard to cut out the tag, then added the pink patterned paper and stamped the sentiment on top. I finished the tag off with a bow. The Stamping Boutique is also sponsoring Link Up for Pink's link up party. Thank you for playing along with us in Flourishes Timeless Tuesday!! Darling card Kim. Such a sweet image. Love the pretty papers and paper flower. The sheer ribbon looks aweasome. Thank you for playing along with us at The Sweet Stop this week. A really cute card. Love the image and your coloring is great. Your design and embellies just make a perfect card. 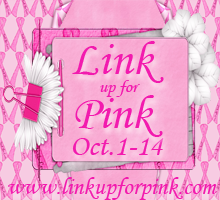 Thanks for joining Link Up for Pink and good luck in the draw. Very cute. Thanks for joining Speedy Fox and Friends. Adorable image! Very pretty card! Pink is one of my favorite colors! Thanks for joining us this week at FOSTV! What a sweet card! Thanks for playing along with us at The Sweet Stop! Thank you for joining Link Up for Pink, hope to see more of your cards entered. This is just precious Kim! Thanks so much for joining our "TIC-TAC-TOE" challenge at Shelly's Images! Please come back and join us again real soon!! Such a pretty card! thanks for joining us and helping us spread BCA at LUFP! Beautiful design, love all the details. Cute card. Love the soft colors. Thanks for playing along with Friends of SpeedyTV. We hope to see you again next week. Be sure to check out all the other challenges on SpeedyTV for more chances to win free stamp sets from Marks Finest Papers, a Heinrich Co. CUTE!!!! How fun is that image!!! Absolutely ADORABLE card!!! Thanks so much for playing the Copic Oz Challenge and helping us raise funds for the McGrath Foundation!!! So pretty. I love the greens and pinks. And the wrap flower with pearl are the perfect decoration. Thanks so much for playing along with our Tic Tac Toe challenge at Shelly's Images. We hope you join us again soon.